On the 47th to 52nd floors of the new Toranomon Hills skyscraper is one of Tokyo’s newest hotels. 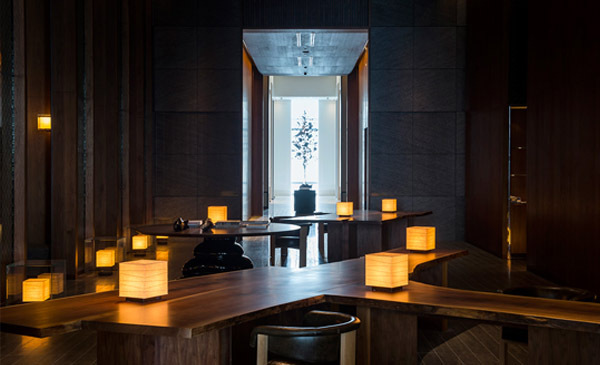 Andaz Tokyo Toranomon Hills—the Hyatt-owned brand’s second property in Asia—is aiming for a sophisticated yet simple approach to a luxurious stay, removing much of the over-formality and international approach commonly found among its fellow five-star compatriots in Tokyo. As we saw with Andaz Peninsula Papagayo in Costa Rica, the boutique hotel chain makes commendable efforts to incorporate the local environment and culture (whether it’s Savannah, Georgia or Shanghai, China) into its design and service. One of the key takeaways: the Japanese take their baths seriously. Two different designers were brought on board for Andaz Tokyo: Taiwanese-American designer Tony Chi (who left his mark on NYC’s Andaz 5th Avenue, Park Hyatt Shanghai and other locales around the world) took over the communal lounge, restaurant and guestrooms, while Japanese designer (and a chef who owns two restaurants) Shinichiro Ogata was tasked with the rooftop bar, event spaces (“Andaz Studios”), wedding chapel and the spa. 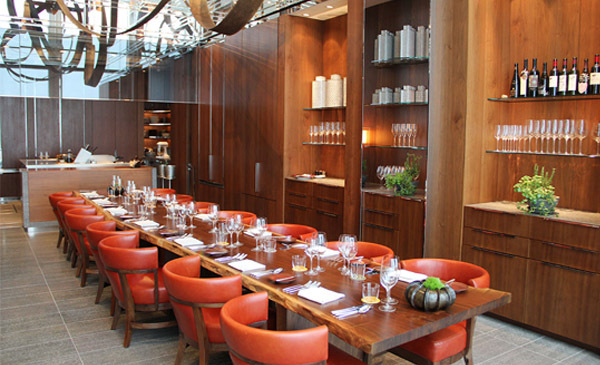 It’s immediately apparent that Chi’s vision for the 47th floor was natural materials, as walnut wood from Hokkaido is found everywhere—from the low tables to the walls (complemented by Charlie Whinney’s massive steam-bent hardwood sculptures that are suspended from the ceiling). The elevators also feature washi paper artwork in the shape of fish. 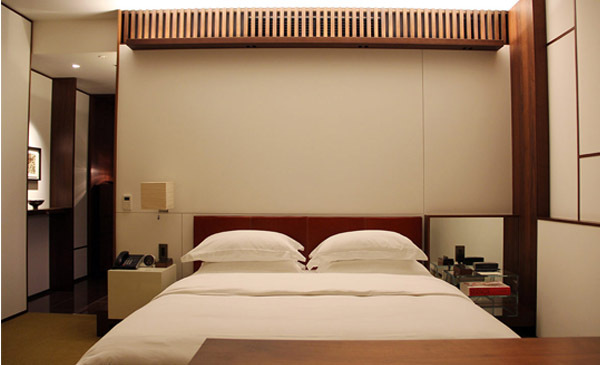 The 50 square meters that comprise the standard guestrooms, designed by Chi, are divided equally between the bedroom area and the bathroom—a reflection of Japan’s dedicated bathing culture. Soak and relax in the circular tub, cleanse off in the rain-shower, and slip into either a fluffy bathrobe or specially made yukatas (light kimonos) afterwards. But the high-tech toilet is what captured our hearts during the stay; aside from the programmable bidet and heated seat, the automatic lifting and closing of the seat (and flushing) means you’ll never have to touch a toilet again—until you return to “civilization,” that is. The movable partitions by the bathroom and foyer are a reference to sh?ji, the sliding doors between rooms found in traditional Japanese homes. The carpet in the bedroom area feels like an out-of-place Western touch at first, but the mossy yellow green color echoes the idea of stepping into a serene garden, and being in direct touch with nature. 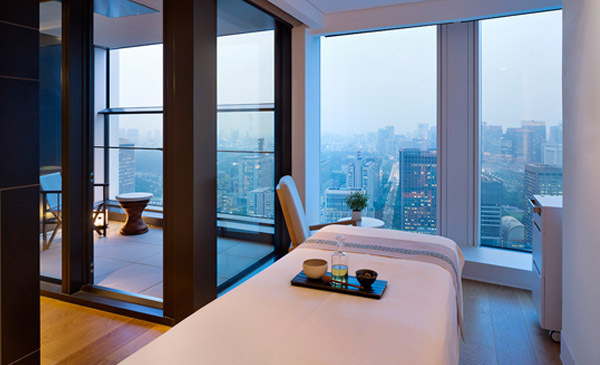 Out of the 164 guestrooms, only eight are suites—and the distinguishing factor between the remaining standard rooms is the view: whether you prefer Tokyo Bay and Rainbow Bridge, or the lit-up Tokyo Tower at night. And with the low bed facing the sizable window, not a flatscreen TV, the view of the city serves as a constant reminder that yes, you are indeed in Tokyo. 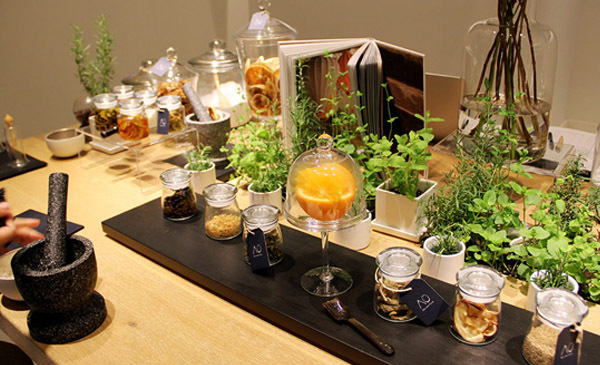 The mini-bar is stocked with Japanese beverages, like Ito En green tea and Suntory Hakushu single malt whisky; like any Andaz property, the non-alcoholic drinks are complimentary and so are the local snacks. Once you’ve tired of your personal bathtub, the 37th floor awaits. 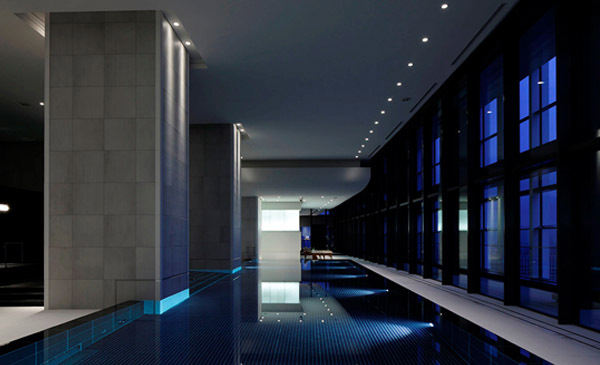 Though a mere elevator ride away, stepping into the AO Spa and Club is akin to entering a different universe, separate from the hotel itself. Ogata, who cites Italian architect Carlo Scarpa as an influence, describes his concept for the spa as “yin and yang.” Men and women, back and forth, stillness in the baths and motion in the pool, the sun then the moon seen through the windows—there are a lot of contrary forces that become carefully balanced through Ogata’s concept of achieving harmony. In lieu of a reception desk, the spa staff invites guests to sit at an apothecary-meets-farmers-market table, dubbed the “Blend Bar.” Here, guests select herbs like mint and thyme (growing right out of the table), locally sourced fresh and dried fruit, spices and oils—many which change alongside the seasons—to incorporate into their personalized spa treatments, from massages to facials to body scrubs. The fitness center is actually substantially more than just a few treadmills, stocked with our favorite Technogym equipment from Italy. Non-hotel guests who wish to use the pool or fitness center must purchase a day pass (¥10,000) or sign up for club membership. The only danger here is that one could easily spend their entire stay in Tokyo on the 37th floor and forget to actually leave the building. The building itself is located in a historic central area of Tokyo—Toranomon, or the “Tiger Gate,” was one of the gates to Edo castle (now the Imperial Palace) where shoguns resided from the 17th to 19th centuries. Today, the area is quiet and business-concentrated. It’s a short walk to the orange Ginza line, which connects you directly to Shibuya, and 10 minutes away by car to Ginza as well as the world-renowned Tsukiji fish market. 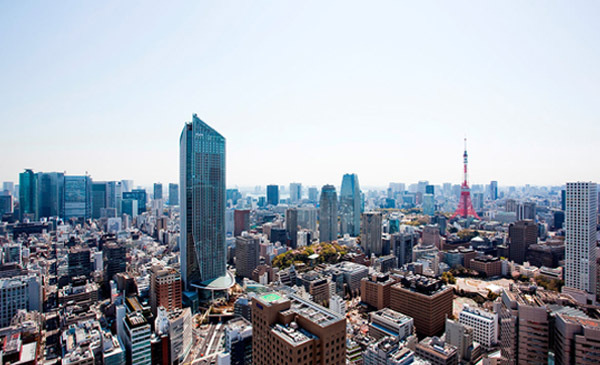 The completed construction of the Toranomon Hills skyscraper this past summer, however, is just the beginning of ambitious development plans, led by its well-known owner, Mori Building—especially with Tokyo hosting the upcoming 2020 Olympics. A new wide boulevard (funnily enough, planned since 1946) connecting the central Tokyo area to eventually, the future Olympic Village and stadiums in the Tokyo Bay area, is in the works; one section has already been completed and links Toranomon Hills to Shinbashi. To make a reservation, book through us by calling 305.445.7791; standard room rates start at ¥40,000 (not including tax and service charges) during the low season.